If you are following along and watching the HCI market evolution, you probably witnessed the dust up which took place between Nutanix and VMware over the last couple of weeks. It all started with Nutanix introducing its 'You Decide' marketing campaign earlier this month which encouraged companies to stop paying virtualization taxes and included several quotes from Nutanix customers to support such a decision. VMware's chief operating officer responded, then the word "bully" was thrown around, and well, things piled on from there. 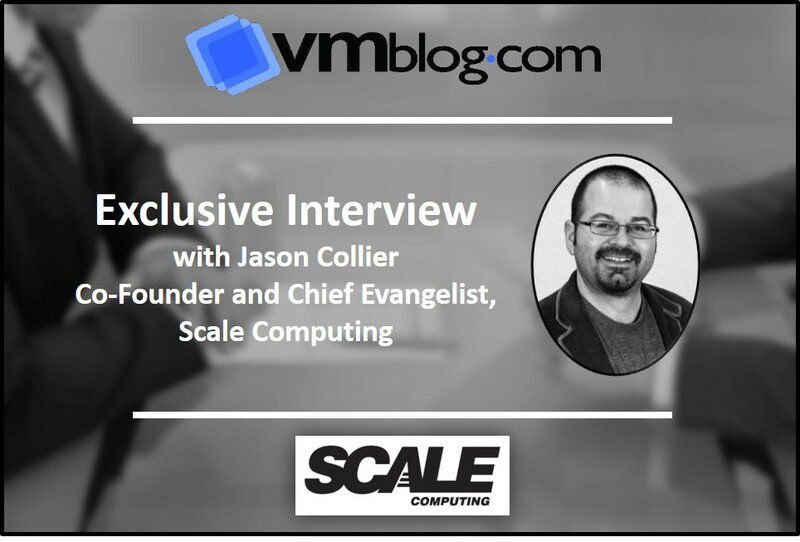 To try and make sense of it all, I reached out to a well respected hyperconvergence evangelist from Scale Computing, Jason Collier, to get his perspective on things. VMblog: A few weeks ago, Nutanix CEO Dheeraj Pandey published a blog post about their "No-VTAX" campaign in which he accused VMware of bullying Nutanix customers over being referenced in this campaign. Is Nutanix right about the "VTAX"? Jason Collier: When Nutanix talks about VTAX, they don't mention VMware specifically but talk about traditional virtualization architectures in which VMware plays a big part. We agree and we think VMware is expensive. Leveraging most of the "advanced" capabilities that VMware provides -- such as live migration (vMotion) and VM HA failover -- requires users to purchase and manage external shared storage systems (SAN, NAS or use special virtual storage appliance VMs) or add software licensing for features like vSAN - the cost and complexity of a typical VMware based resilient infrastructure is beyond what the typical small and mid-market IT shop could or should spend. Factoring in the additional administrative requirements and costs such as trained and certified IT staff brings the TCO (total cost of ownership) of using VMware even higher. The VTAX is real. VMblog: But this notion of the "VTAX" isn't a new concept, right? Collier: Not really. In 2013, we launched our own "VTax" campaign. We had a blog post, created t-shirts, but what we really loved is our unique "Imagine No VTax" song we introduced at Midsize Enterprise Summit in September of that year (I'm the one playing the piano on the iPad). It was our first time at this show, and our bold message was No VTax! We discussed the total cost of owning a VMware environment vs. HC3. We brought home two awards from the event: Best Demonstration of ROI and Best Execution of a Mid-Market IT Solution. VMblog: I get asked this question myself a fair amount of times. Is KVM a real alternative for customers? Collier: Absolutely. KVM is an extremely stable hypervisor platform which is why it is the foundation for Google Cloud, IBM/Redhat, Oracle, Nutanix, us, and many others. KVM was really the ideal choice for our HCI solution because it allowed us to embed the storage with the hypervisor, eliminating storage protocols and VSA architectures found in other HCI solutions. It is a much more cost-effective solution than VMware. VMblog: Gartner identifies both Nutanix and VMware as leaders in the HCI market. How do you view Nutanix, their market leadership, and their pricing? Collier: Nutanix is a market leader because they are selling a lot of HCI and that is good for our market and we want them to succeed, but their market position comes with a higher price tag. We win against Nutanix often because our customers and prospects recognize how more expensive it is. It's a "NuTax" if you will. Nutanix supports multiple hypervisors, including KVM but also including VMware, so their fortunes are partly tied to the higher costs of VMware. There is some level of the pot calling the kettle black with their "No VTAX" campaign. VMblog: In what parts of the market does Scale Computing see "VTAX" having the biggest impact? Collier: We see the pain of VTAX more acutely in small and midmarket organizations and at the Edge in distributed enterprises. Organizations with small IT staffs struggle more with the technical complexities and licensing fees of virtualization solutions like VMware and even Nutanix. At the Edge, few virtualization solutions can scale down to be cost-effective and easy to use at sites with little or no IT staff. VMblog: How does Scale Computing fit in the HCI market along with leaders like Nutanix and VMware? Collier: Scale fits in the market by making our customers happy and successful and by leveraging our technologies where they make the most sense. We've strategically partnered with bigger companies like Lenovo and Schneider Electric because our market has grown beyond primary infrastructure refresh to the growing edge computing needs for distributed enterprises. Our growing customer base is found across almost every sector worldwide - manufacturing, health care, retail, financial services, legal, government, and education - and our customers pay almost half of what Nutanix customers pay. Our Gartner Peer Insights, Spiceworks, TechValidate, and TrustRadius reviews are positive because our HC3 product is extremely easy to install and use, and the Scale Computing support team is committed to helping every customer achieve success. We average an NPS score of 92 following our support calls. That's a remarkably high number for a technology company. We fit because we care about our customers.